Zoar Village in Tuscarawas County is a historic village established in 1817 by 200 German separatists seeking freedom from religious persecution in their own country. These individuals thrived as a society for nearly 80 years, and today, this beautiful village is still home to 75 families who help preserve the legacy of these amazing homes and buildings. The annual Zoar Harvest Festival features crafts, arts, artists and lots of antiques for sale. Plus, like all fun festivals, attendees can enjoy great food, contests, entertainment and even horse-drawn carriage rides. Hundreds of people visit this beautiful property to enjoy time with friends and family in a truly American way. 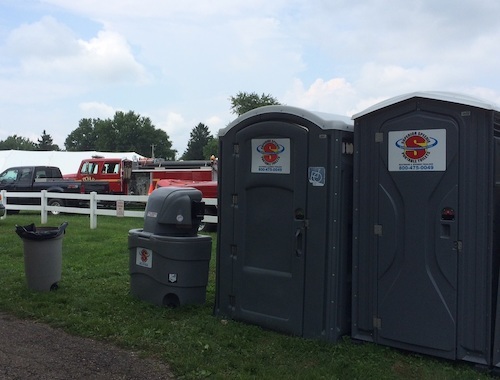 Superior Portables is proud to provide clean, well-maintained porta potties to handle the crowds throughout this great event. We drop off units the day before the event, and clean and maintain them each day of the festival. When the festival ends, we pump and clean each unit and haul it away so organizers don’t have to worry about a thing. Take a look at our photos from the Zoar Harvest Festival, then contact us to request a quote for your next event!